A non-stop adventure! For readers of all ages. Modo, who first made his appearance in The Hunchback Assignments, is a young, disfigured spy trained to be the ultimate secret agent. Not only is Modo brilliant and strong, but he also has a special ability: he can temporarily take on the appearance of other people. 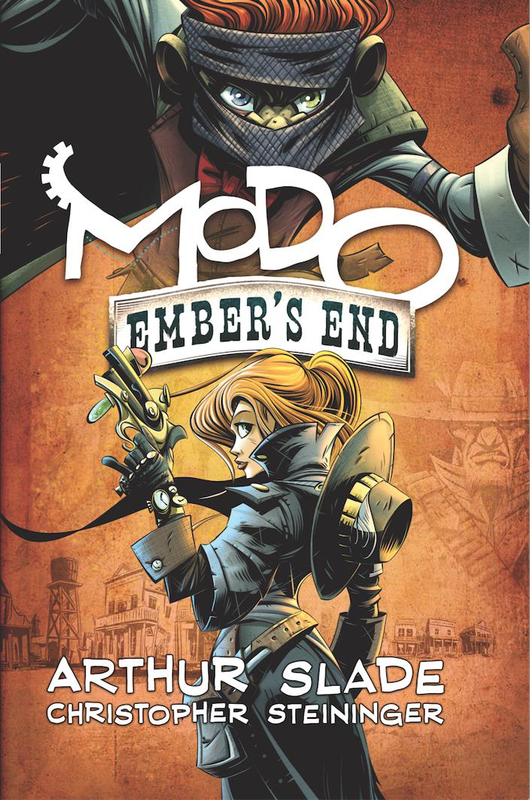 While on holiday, Modo and fellow spy Octavia Milkweed find themselves in Ember's End. Created by the slightly mad scientific genius Dr. Ebenezer Ember, this is no ordinary wild-west town. It is surrounded by an energy field that prevents gunpowder from firing, and messages are sent via pneumatic tubes. There are also rumors that before Dr. Ember died, he built a weapon so powerful it could end all wars. With the local sheriff recently deceased, the two travelers are suddenly put in charge of Ember's End law enforcement. Modo is available now at your local bookstore! Steininger’s stylized, angular illustrations bring a cinematic energy to this Wild West fantasy. Octavia’s wisecracks and hard-edged attitude steal the show, and Slade and Steininger balance exposition with fun, sometimes slapstick action sequences when the deputies clash with Ogden and his henchmen.